Image via WikipediaWith the longer days and increasingly warmer weather we are getting out in Oregon, it is hard to ignore that the summer season is right around the corner. Every couple, family or individual deserves to take some time off and enjoy the nice weather, so why not make a vacation out of it out west! Here are some fun vacation ideas and recommendations to help start your planning. Hiking is a great way to discover the most beautiful places in the world, with the freedom to choose when are where you want to go. If you are in the learning mood, you can take a walking tour of a national park or landmark location. Quite often they are free or at a low cost, and they make you appreciate your surroundings even more. There are no shortages of mountains out west. The Rockies run from Mexico to Canada, and have a great deal of variety to meet your novice or advanced mountaineering needs. It is usually best to refer to a local guide book or resource when choosing mountains to hike or explore. Always make sure you've done your research so you are never in over your head! With mountains come rivers, and with rivers come endless activities. Some of the more popular activities include whitewater rafting tours, fly fishing tours and river side camping. 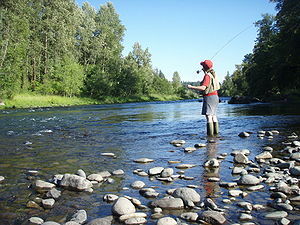 Like mountain activities, river activities out west have a large range in experience level. Always know what you are getting yourself into! With all the activities you will put yourself through, plan out a place to stay in advanced based on your comfort needs. If you plan on sleeping out under the stars, that may seem like not much effort, but do you research and find a park or location that allows overnight camping. If you're more like me, and appreciate a warm and cozy night, take a stay in a condo. If you're coming out to Oregon, I would take a look at some Oregon condo vacation rentals. This site has locations in Depoe, Newport, Gleneden and Bend Oregon, but also has locations all over the American West. Best of luck to your vacation planning and happy travels! I love vacation, i am crazy about this days. And also i like your blog information. I will going with my family in this place. Thanks for your kind of information dear.